Library of America, 9781598530353, 960pp. Published to coincide with editor Blake Bailey's groundbreaking new biography, here are the five novels of John Cheever, together in one volume for the first time. In these dazzling works Cheever laid bare the failings and foibles of not just the ascendant postwar elite but also the fallen Yankee aristocrats who stubbornly and often grotesquely and hilariously cling to their shabby gentility as the last vestige of former glory. Complete Novels gathers: the riotous family saga The Wapshot Chronicle (winner of the National Book Award) and its sequel The Wapshot Scandal (winner of the William Dean Howells Medal); the dark suburban drama Bullet Park ("a magnificent work of fiction," John Gardner remarked in The New York Times Book Review); the prison novel Falconer, a radical departure that met with both critical and popular acclaim; and the lyrical ecological fable Oh What a Paradise It Seems. A companion volume, Collected Stories and Other Writings, is the largest edition of Cheever's stories ever. John Cheever (1912-1982) was one of the most celebrated novelists and short story writers of the last century, winner of the National Book Award for his first novel, The Wapshot Chronicle (1957), and both the Pulitzer Prize and National Book Critics Circle Award for The Stories of John Cheever (1978). Blake Bailey is the author of A Tragic Honesty: The Life and Work of Richard Yates. 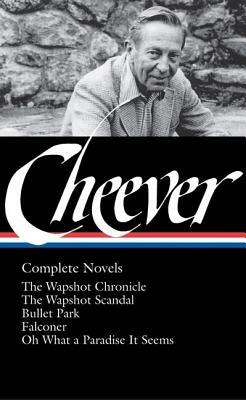 His 2009 biography of John Cheever won the National Book Critics Circle Award.